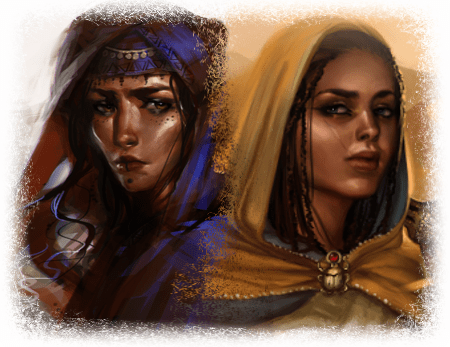 Easily the most fun that I have had in creating Tempest: Shards of the Gods has been commissioning illustrations for its many cards. There are a bunch of reasons that I could say that is (eg it’s amazing seeing a vision sculpted before your eyes, it’s entertaining and enlightening to see the process behind card art, art is fun) but the primary reason really comes down to this: artists are great people. They are full of energy, willing to go out on a limb with a concept, dedicated to creating the best piece possible, inspired, and have the knowledge and experience to turn a half-formed concept into a dazzling illustration. On Instagram at the moment, I have split up posting through the week into Work-in-Progress Wednesday, Throwback Sketch Thursday, and Final Art Friday. 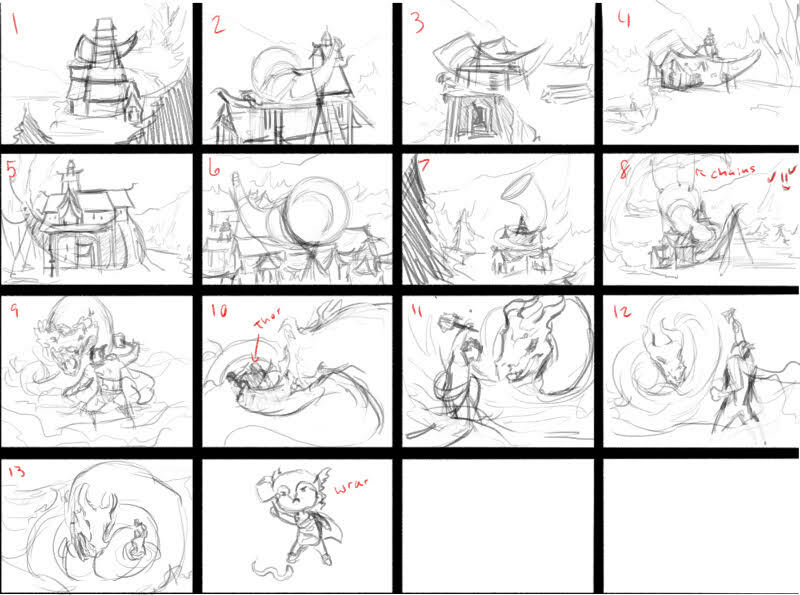 I figure it’s a fun way to show the behind-the-scenes processes on Tempest‘s many artworks. 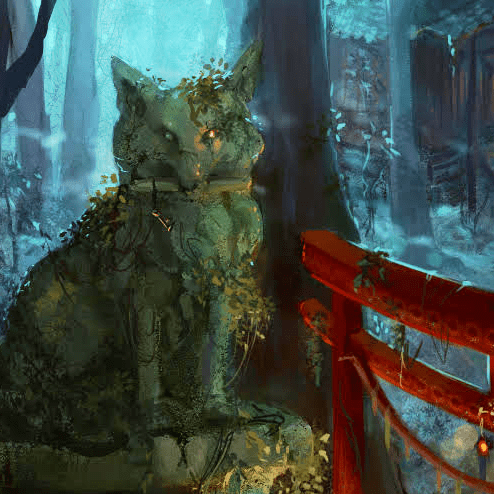 In an early post on this site, Birth of a Card: “Komainu Guardian”, I described the process behind having a piece of art commissioned and completed. (You can also read an interview with the artist featured in that post here.) Well it has been one year since that post went out, and I have learned a lot about art direction in that time. I have put together a list of the 5 most important things I’ve learned in that time. Okay, this isn’t one I have personally learned through experience but rather a common sense thing that I see being complained about (on both sides of the drawing board) all the time. I would be absolutely remiss not to mention it here: pay your artist, they too need to eat. You should set very clear useage/rights allocations at the beginning of working with an artist, as everyone is different and it is easy to get shy when it comes to discussing money or intellectual property. This will ensure you are both on the same page, and you won’t get caught out in a disagreement at a later date. And you can give your artist exposure (which they are entitled to anyway through “moral rights”), you can allow an artist to use the work in their portfolio (and I have found that the positive publicity from this outweighs the work being “out there”), you can pay royalties (if you want to, though this can be an administrative hassle), you can also commission additional work if you like what they do, and you can pay them at the same time. Just be willing to suffer a couple of hits to your bank account if you commission someone you end up disliking. That’s just a cost you have to factor in. Don’t hold competitions for the best art. Don’t take free art. Don’t pay entirely on royalties or conditional future promises. Pay your artists. I found most of the artists for Tempest through websites like DeviantArt, or through trade shows like Supanova or ComicCon. Occasionally, an artist who was too busy would refer me to another artist. For every artist I found, I scanned through their portfolio, finding the illustrations I liked (and those I didn’t) and building an idea of their style in my mind. Do they tend to do portraits of people or picturesque landscapes? Do they work with washes or brushes (even digital styles)? Can they draw animals/people/hands/eyes to a standard (or in a style) that I like? Importantly, I also check how their style has evolved over time. I might like (or dislike) an illustration that I see, but if I can point to another illustration they have done as an example, I end up with the kind of style I want. After I have a bunch of examples, I approach the artist and inquire about commissions. I explain a bit about what Tempest is and what kind of style I am looking for. I ask for quotes on pieces of work that are “to the same level of detail as X, Y and Z”, providing examples of pieces they have done that I liked. I use their work as an example because they can figure out from there how long it will probably take to do a piece to that level of detail. I also know from my examples that “this artist does excellent faces, but backgrounds are always a little weird” or “I love the backgrounds and want all of mine to be done by this person”. If you know what your artist’s capabilities are, and what they are willing or able to do, you will rarely be disappointed by what you get! This goes hand-in-hand with the lesson “have a proper concept in mind”. Know what you are asking for, and be certain of it from the outset! The artistic process is awesome and fun, but if you are using it to develop an idea, you will probably be unhappy with what you get. Bizarre dream-state battle events happen in bright rainbow splashes of colour. In game, the card enables the player to gain resources. I’ve played around with a number of things for this, but I keep coming back to [[image]]. Now I absolutely hate the idea of saying “this but not” … so what I’d like to do is identify what I keep coming back to this image for, and ask for something with those elements. Sense of some impending event that will cause huge change. Dreamscape landscape with your explosive colour pallette. Objects of that landscape are not actually what they appear (in the example, it’s a forest of trees in a desert, but it’s all made of abstract smoke). In hindsight, this was a bad brief. It told the artist nothing of what I wanted really, gave too much scope (so that I would be disappointed in whatever came in) and by referencing another existing image, I curtailed the creativity that came when I previously let this artist go and run with a concept. 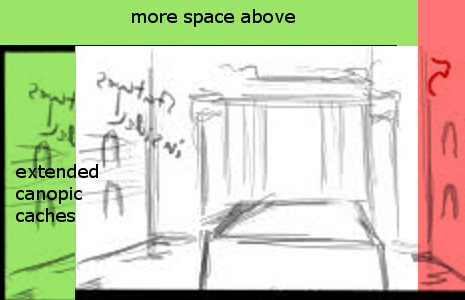 As a result, all of the sketches that came back were returned looking very similar to the example picture. Image: A stone Japanese Guardian Fox stands alert and attentive (or rests with a wary eye open) as a guardian protector before a shrine. It sits or lays on a small pillar, and there is moss growing on the pillar. The statue is alive, rather than just a statue, so it isn’t fused with the pillar and probably doesn’t have moss growing on the parts of it that would rub against each other. It is probably quite weathered and a little eroded as this is an ancient statue. A tasseled key (or a bound scroll) either rests on its paw or is held in its mouth. Palette: The Japanese faction uses a lot of reds and yellows. In this instance, the stone should be grey, there should be green moss indicating that this is ancient, and plenty of green in the background. The statue may also have elements of red about it, either on the tassel or scroll binding. Behind it there is a temple that is wood with red paint. the less it will cost (or, if you work on a per-piece costing, the more detail that can be added to the finished piece). Remember that game, Chinese Whispers? 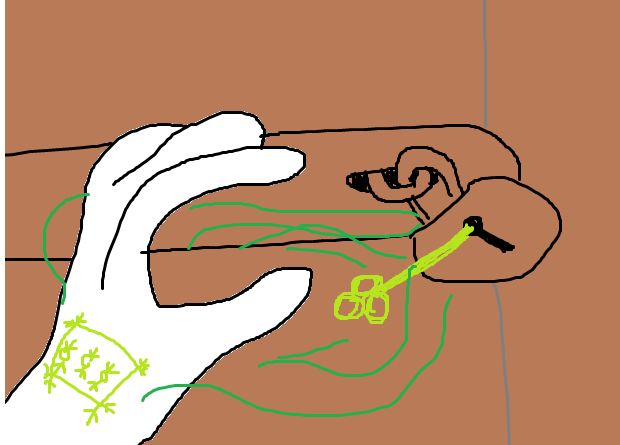 (I’m sure there’s a more politically correct term for it now, and I seem to recall a Pictionary-like version of it recently, but you know what I’m talking about, right?) You whisper something to someone, they whisper it on, and on, and on. And unless you have some jerk in the middle who changes it up completely just to watch the world burn, you end up with a hilarious mockery of the original statement and a sense of wonder that people don’t have perfect memory. I’ve discovered that art is a lot like that. You envision something perfectly, write a clear brief, and wait with bated breath as the artist turns your brainchild into a masterpiece. Then it comes back and they have completely misunderstood what you wanted. No, you think, I wanted the helmet to look like a stag head… I didn’t want it to BE a stag head. You look back at your brief and see it clearly written there: “helmet is like a stag head made of metal”. But the artist has missed “like” and “made of metal”. The pose is wrong, the colours are wrong, and why does this character from popular mythology look completely different from what you wanted? Sometimes it’s the opposite, and the artist has done something completely different from what you envisioned. But it’s so good that you think Yeah, that’s what I wanted in the first place. Great idea, me. Enter sketches. I only once commissioned art without sketches or revisions, and I will never do so again. Artists do sketches (or even rough compositions) before they begin working on something. They can also stop and give you work-in-progress shots midway through to show colour composition and style. That adds very little time to the process and can save lots of time and heartache later. Don’t be afraid to ask to see initial sketches or work-in-progress pieces, and don’t be afraid to ask for revisions. Just make clear before work starts that you want these things. That way the artist can factor that into their quote. They shouldn’t be charging more to show you sketches, or to show you work-in-progress; and their initial quote should factor in that you may want minor alterations. But they need to know that you need these things. If you have more than 1 sketch, I always like to hear which one the artist likes the most, because that’s the one they’re most passionate about. Option for reasonable alterations to the finished piece. With sketches, I also tend to combine elements, saying things like “let’s take the pose from #1, but the angle of #3 and the weapons from #2”. Add more space to left/right/top so that I can resize the piece for the final card, and so that I can extend the art into the printing bleed zone (that 1/8th” of the card that is cut off, but the printer may leave 0.5mm either side, so you want the art there just in case. Add more “blank” space to the top, so that I can fit the card’s name there. Fix eyes or hands that are too big or weirdly positioned. Add shadows/source lighting on a specific part. 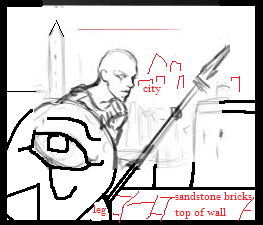 Leave off some foreground element as it distracts from the piece, or because I want to animate the art later and will manually add in that element myself at that point. 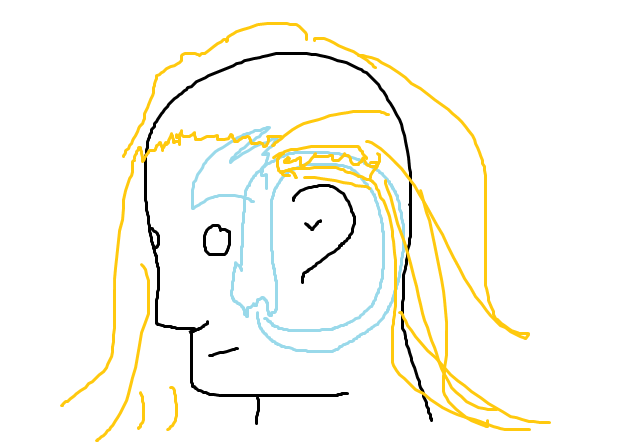 When I ask for changes to positioning, art size, or pose, I make sure I send at least an MS Paint version with a badly drawn sketch on it to give some sense of what I am really looking for. Just because I am not an artist doesn’t mean I can’t give an indication of what I want! And I always say “please”, and point out things I like. Nobody likes getting only criticism! We are too close to the images we want created, and we have the benefit of seeing the whole process of the image. Our players do not. It is only with hindsight, when we look back at an image, that we see something wrong with it. Maybe it’s a little detail, like an eye out of place or a “clipping error” (where one layer ends up underneath/on top of something it should not have) or maybe it’s something bigger (like that picture that some people see a duck and others see a rabbit, you don’t want your “snake monster” to look like a tree stump to your players). Whatever the case, I have many times found myself looking at a piece of finished art, marvelling at how amazing it is, and then showing it to a friend or family member and hearing a suggestion that has then improved the piece greatly. Odd eye/ear perspective on the Criosphinx only picked up from sharing the image with friends. The artist is too close to the images they create too. While they are magnificent people, they are also not perfect, and miss things. Good artists will appreciate having errors pointed out to them, as they don’t want those errors showing up on their finished work either! I have also learned to be more honest as I have continued to commission art. I always remember to point out things I like about an illustration, along with things I’d like changed (and clear examples of how I want them changed). I also break down my feedback into things that need to change to make the image work (eg “that woman’s hand is positioned weirdly”, “that armour looks anachronistic”, or “that head is too big”) and things that would be nice, but are not essential (eg in a recent piece I asked for the addition of a squirrel on the branches of Yggdrasil the world tree). The more people who see the art, the more ideas you will get. People are always willing to toss in their 5 cents of wisdom when they have the opportunity to contribute to something creative! Sorry to end on a downer, but I promise it gets better by the end. Sometimes, an illustration just doesn’t work. The example I provided up in #3 for Dream Foretelling was just one such example. Thankfully, in Tempest I have only disliked a final piece 4 times out of 68 done so far. 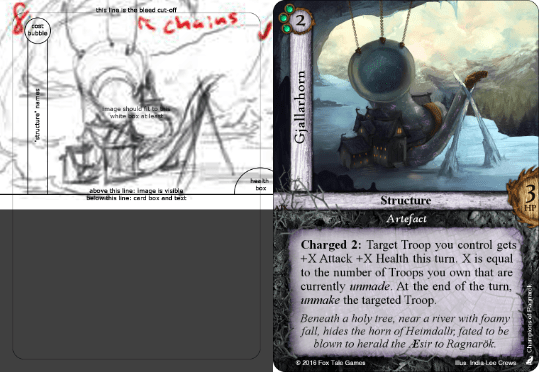 Two of those, I found parts of the illustration I did like, and repurposed them for other cards. One of them I still need to recommission. And the last, Dream Foretelling, is where I learned my lesson. After the sketches came back, I still wasn’t sure on the concept or if I even liked where the piece was going. At the time, I figured that persevering on the piece would yield some magical fruit. Thankfully, the artist and I had a working relationship that allowed for multiple corrections to the final piece. But still, nothing quite worked. It wasn’t even that the image itself wasn’t well-drawn – quite the opposite! It just wasn’t clicking for me, and I knew if it didn’t click for me, it wouldn’t for players either. In the end, the artist apologised for not creating something that I liked, and offered to take no payment for the original image. I felt pretty damn guilty about that because it wasn’t her fault I didn’t like it – I had the wrong idea from the start. I put extra thought into the piece for its second brief. I went back to the card’s concept, thinking, How did the Ancient Greeks tell the future? Turns out, there were three main ways: oracles, augury and lightning. 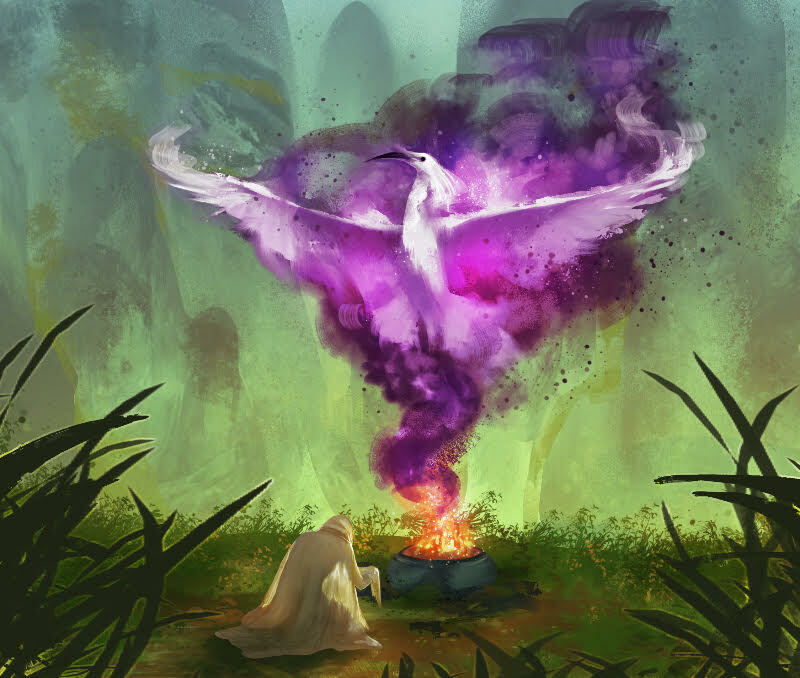 The original concept for the card was that Athena was sending dreams to prophecise the future. But the more I read, the more I discovered that the Ancient Greeks didn’t interpret dreams as prophecy. Instead, augury was often used as a method, by interpreting the flight patterns of birds, particularly cranes. Alright, let’s have another go at Dream Foretelling. I’ve been playing around with a number of different ideas. One that keeps sticking out to me is that Greek diviners didn’t actually rely on dreams much for their divinations! Which means I was probably even coming at this from the wrong direction. Having done actual research now, two symbols that keep popping up are birds and lightning. Watching birds (particularly herons, sparrows and owls) was an omen for future success or failure (the omen against the Trojan war was a snake eating ten sparrows). Lightning (and the direction that it came from) was a sign from Zeus of the future. Since we have a bit of a bird theme going, it’s probably best to stick with birds instead of lightning! Style: Let’s do something similar as with the Einherjar image, where smoke swirls around and forms an image – more abstract though as the smoke forms the figure rather than swirling around a silhouette. Similar brush-stroke look for the smoke, maybe an ash or cinder grey/orange look for the speckles. Palette: Smoke is a strong white with some shades of purple, and some dark greys mixed in. Bright green background with orange from the fire should give a nice contrast, but if you think of something better please do tell! As you can see from the composite below, the white parts of the smoke provide the best contrasts (especially those swirling bits of smoke on the heron’s wing (left on the image). I put a couple other pictures below that I was playing around with for colours and smoke styles. When the sketches came back, I immediately knew that I had made the right decision. 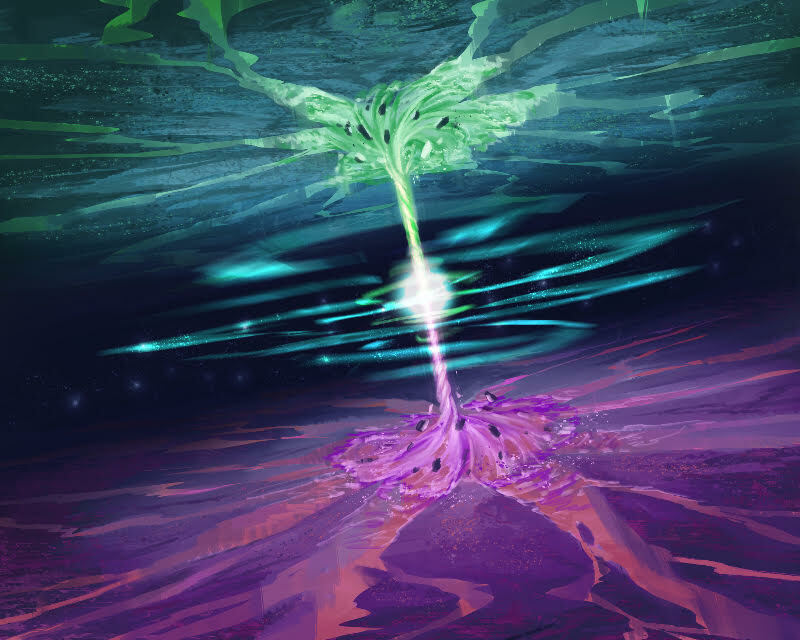 The illustration made sense in the context of the game, it grounded the theme in a mythic reality instead of an abstract dreamspace, and it reinforced the “bird” and “prophecy” theme. And what about the name? That was easy. 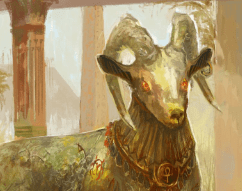 The card Dream Foretelling became Heronmark Augury. Turns out, the name of an unprinted card is the easiest thing in the world to change! What do you think? Are you an artist and I have this completely wrong? Are you a designer or publisher looking for art or with similar/different experiences? I’d love to hear from you about your own top 5!